How do you control an RC car with a microcontroller? It's easy. The steering servo is controlled with servo pulses (surprising, no?) 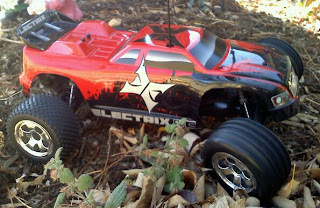 and so is the Electronic Speed Controller (ESC) aka throttle. The Arduino servo library makes coding a breeze. Wiring is easy too. The ESC and Servo both use standard 3-wire RC servo connectors. The ESC has a 5V regulator (Battery Elimination Circuit or BEC). Wire the BEC's 5V and GND to power the Arduino, and wire the signal line to one of the digital pins. Then wire the steering servo's signal wire to another digital pin and connect the power and ground wires so the servo gets power. Here's the code to control the car. Easy peasy. I used digital pins 9 and 10. Getting the range and center set correctly on the servo and throttle took quite a bit of trial and error. You don't want to force the steering servo to full lock as that is hard on the servo. That's one small step of progress with a massive, overwhelming list of things left to do. But hey, every journey, however long and arduous, starts with a single step, right? Sparkfun AVC 2011: It's Official!